In the contemporary world of internal communication and employee communications, users can easily be overwhelmed by an ocean of information. And in many cases, when employees want to search their own internal communication platform for relevant information, announcements, or articles, they become “lost at sea,” so to speak, and turn flustered. In some cases, they stop using the search engine features of their platform altogether, don’t seek out the information they need to do their jobs well, and cease engaging with the communications program. In this first article from our “Internal Communication Platform Benchmarks” series, we take a look at how important content searches are to any internal communication or employee communications program, and we’ll help you answer the question: can your users effectively search for the content they need on your company’s internal communciation platform? Employees have to look in multiple places to find what they need, including internal content, curated content created by the intelligence team, content coming from social media feeds, etc. Rather than having a single, aggregated search engine, the sources have to be dug for in different places. A search for content may turn up hundreds of results, but without any way to filter or classify the information. As a result, they often only look at the first 10 and ignore the rest. And the level of noise on enterprise social networks simply makes it hard to find information without the appropriate channels. Sometimes the relevant content is simply in a language that they do not speak. And with so much content in English, employees who don’t speak English as a first language—or speak it all, for that matter—are at a distinct disadvantage. The relevant content may be in the form of a video—a video which the search engine doesn’t register. Employees may miss out on exactly what they’re looking for because the content they seek isn’t text. This one is simple. Sometimes, the search engine simply isn’t up to speed. And if employees know that any search they do will result in seconds of that little spinning wheel while the engine gathers the results, they just won’t bother with it. ✔ Can a complete, aggregated search be conducted on a single search engine interface, that includes both internal and aggregated external content? ✔ Can results be filtered according to keyword, themed channel, category, media…? ✔ Is it possible to order results by date or relevance? ✔ Does your platform include real-time translation, so that the search engine can index translated content as well? ✔ Can your platform perform multi-media searches, beyond simple text? ✔ Can your communications search engine retrieve results in an average of less than 400 milliseconds? Looking for a new solution? Sociabble can help. All the internal and external content is gathered in one single place that’s easy for employees to access and use. And the search engine indexes both kinds of content, from within the company and without. Our search engine is a multi-faceted engine. You can filter the results through multiple criteria, and even filter the results by designated Sociabble channels, category tags, original source (Facebook, RSS, etc. ), date, and relevance. We index the content in the original language but also the translated versions that have been converted by our translation engine (and that can be edited by your admins if needed). The results of the search show the content in the language you understand. We have the ability to automatically index the content of the video, to translate it in multiple languages to make it available for search. When looking at video, people can directly go to the part of the video corresponding to their search. Our search engine is cutting-edge, designed and engineered in France by leading experts in the field. Average result time for searches on our platform is 258 milliseconds. Which is actually faster than the blink of an eye—which is around 300 milliseconds. The Sociabble search engine can sort, index, and translate results, all in literally less than a blink of an eye. When it comes to content searches, the Sociabble platform is top-of-the-line. But as a complete set of employee communication tools, it also does so much more. We’ve already helped dozens of companies in over 80 countries around the world get their employee communications programs off the ground. We have worked with brands like Coca-Cola, Walt Disney, Microsoft, Groupe Renault, and L’Oreal, to name a few. And we’ve overseen launches and helped steward them from start to finish. We know how to make sure your internal communication and employee communications programs are a success. And with Sociabble, we offer guidance and support to back up the technology. Our comprehensive platform comes with launch support and CSM guidance whenever you need it. And with offices in Paris, New York, London, and Mumbai, we’re never far away. 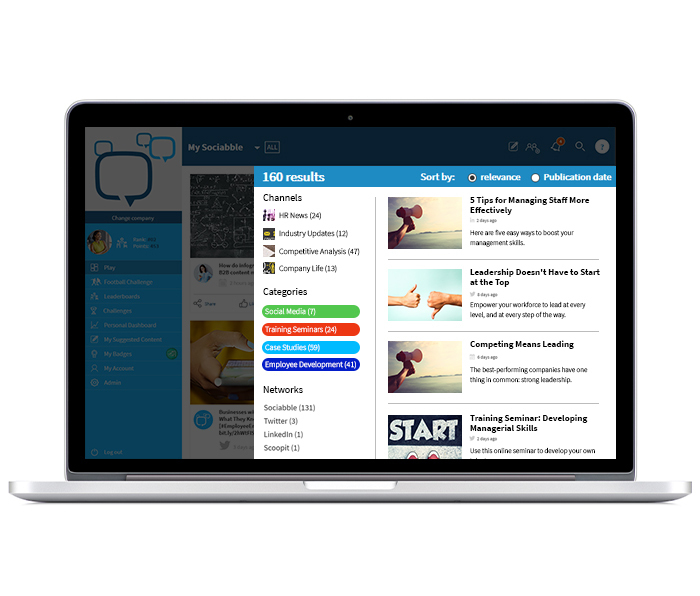 To receive a free demo and see Sociabble’s full capabilities in action, click here. Formerly a New Yorker, Dane H. now makes his home in Paris, France. In addition to working as a copywriter and content editor, he is also an author of novels and non-fiction books. When not penning blog posts or proofing galleys, he enjoys travel, history, foreign languages, and discovering the foods of distant lands. More articles by Dane H.